Fishbourne ferry terminal has frequent ferry crossings between the Isle of Wight and Portsmouth in mainland England, and is a great starting point for your Isle of Wight holiday. Fishbourne (not to be confused with Fishbourne in West Sussex) is a small seaside village on the Isle of Wight which has a little beach where you can watch boats sailing to and from the island, as well as a large, family-friendly pub. A short distance away from Fishbourne are Quarr Abbey (a great spot to see red squirrels), Robin Hill Amusement Park (a great family day out), the Isle of Wight Steam Railway, Monkey Haven and Queen Victoria's Osborne House. The island's capital of Ryde is just a few minute's car journey along the A3054. Port address: Fishbourne Lane, Ryde, Isle of Wight, PO33 4EU, United Kingdom. From Newport follow the A3054 to Fishbourne Ferry Terminal. 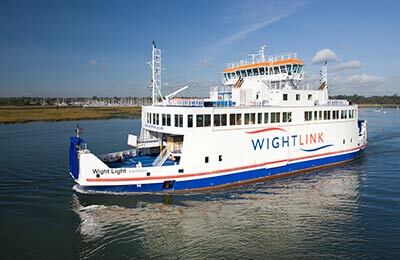 There are no direct public transport services to Fishbourne ferry port and terminal. Unfortunately, there is no direct public transport service to the Fishbourne Ferry port and tableerminal. The nearest bus stop is at Kite Hill around a 15 minute walk away and is served by Southern Vectis bus Route 9, which links Newport and Ryde. Café/Bar facilities are available inside the terminal. Parking is available at the ferry terminal and is £8 for 16-24 hours. For any hours over 24, a daily rate of £8 will apply. Evening and overnight parking (4pm - 5am) is £4. Please note that car parking at the Terminal is limited and may be restricted at peak times. This information is provided for guidance only.